What’s your favourite sandwich? It’s the eternal question with an infinite number of answers. If you can eat it then you can put it atop or between pieces of bread. A sandwich can be anything your heart desires; a Bánh mì bursting with savoury pork and fresh coriander in a crisp light airy Vietnamese baguette, a beef burger crusty on the outside but pink in the middle with it’s juices soaking into a toasted light brioche bun, or for me the mighty Reuben Sandwich. That combination of corned or pastrami beef, melted cheese, sauerkraut, russian or thousand island dressing and rye bread. 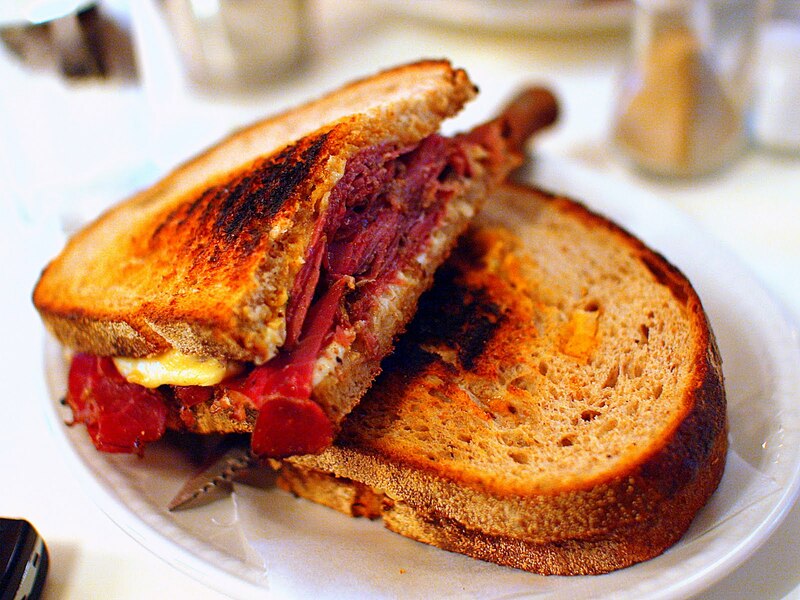 It’s a combination that’s hard to find in the UK, where are you going to get good corned beef or pastrami from huh? 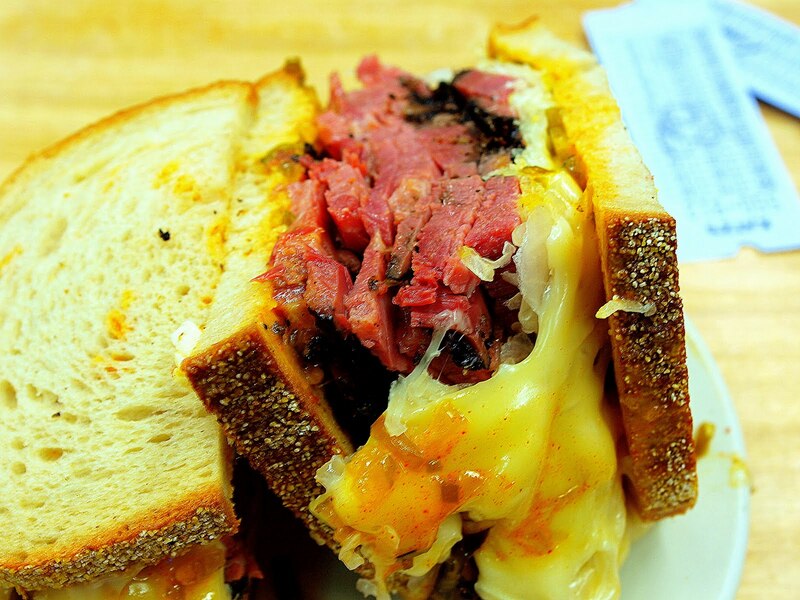 No, the first Reuben sandwich I ever ate was in the near legendary Katz’s Deli on East Houston St in New York City. Giant slabs of the softest juiciest pastrami topped with sauerkraut and melted Swiss cheese. The bread is a side note just there to fool you that it is a sandwich, honest! These are the mythological sky-high NY deli-style sandwiches that your friends have told you about in their holiday stories. Their expressions become manic as they describe to you the heft and wonder of these beasts. At Katz’s the server slices the freshly steamed pastrami thickly in front of you before laying on a piece of rye with sauerkraut, russian dressing and swiss cheese. He microwaves it to make sure the cheese is nice and melty before topping it off with another slice of rye smeared with mustard. There’s no doubt here that the pastrami is the star of the show. The bread is there to keep your fingers clean initially but at the end of the sandwich you’re just shovelling slabs of savoury cured beef into your gob with careless abandon. That’s why napkins were invented. So coming back to Blighty after that first trip to New York I just had to try and smoke my own pastrami. It’s quite a straightforward process really, buy brisket, brine it, smoke it, steam it. But achieving the level of pastrami excellence that you find at Katz’s is not simple at all. The biggest barrier is the meat, you just can’t get the heavily marbled stuff here unless you really look for it. An epic grail quest that Nick has been on and returned triumphant! Myself? After a number of less than satisfying attempts at smoking brisket I gave up trying to recreate that Katz’s sandwich though the yearning for it never left me. When Mishkin’s in Covent Garden opened to rave reviews I couldn’t help noticing that they had Reuben on their menu too. It’s very different to the Katz’s version as you can see. This one is much slimmer, the pastrami has been sliced thinly and the whole lot looks to have been put in a panini press. But the revelation is that I actually enjoyed this more than Katz’s version. 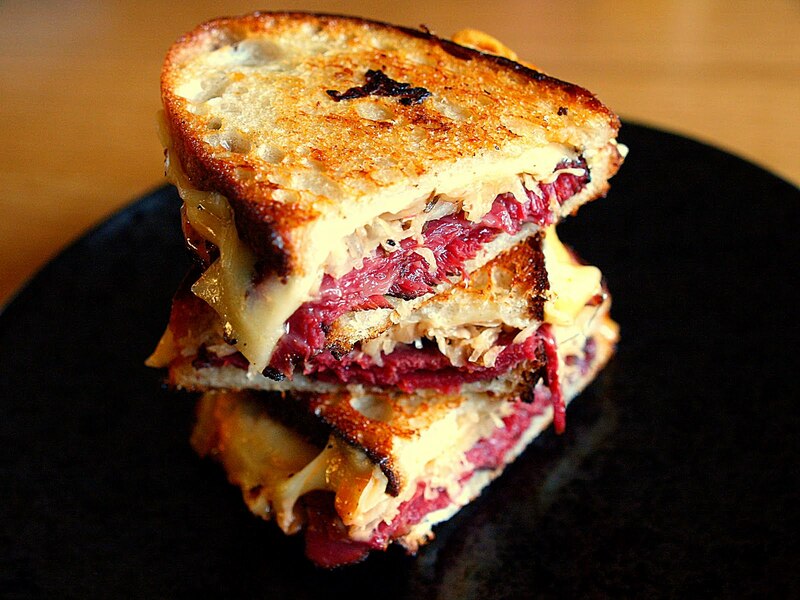 Mishkin’s Reuben is a grilled cheese sandwich, all the component parts are in balance and fused together. Although the thinly sliced pastrami looked less impressive it still tasted wonderful, every bite had a little bread, sauerkraut, cheese, dressing and a hint of caraway seed. It was just a completely different eating experience to the mile-high sandwich at Katz’s. I knew that I had to try and recreate this. Luckily a Reuben topic cropped up on egullet at around the same. Apparently to real Reuben aficionados the mile-high offerings are abominations, Reuben purists insist that it should be a thin grilled cheese sandwich made with corned beef not pastrami. Well, I wouldn’t call myself a purist but I’m certainly a grilled Reuben convert and so with a freezer full of beef cheeks I decided to make pastrami with them so I could feed my craving. 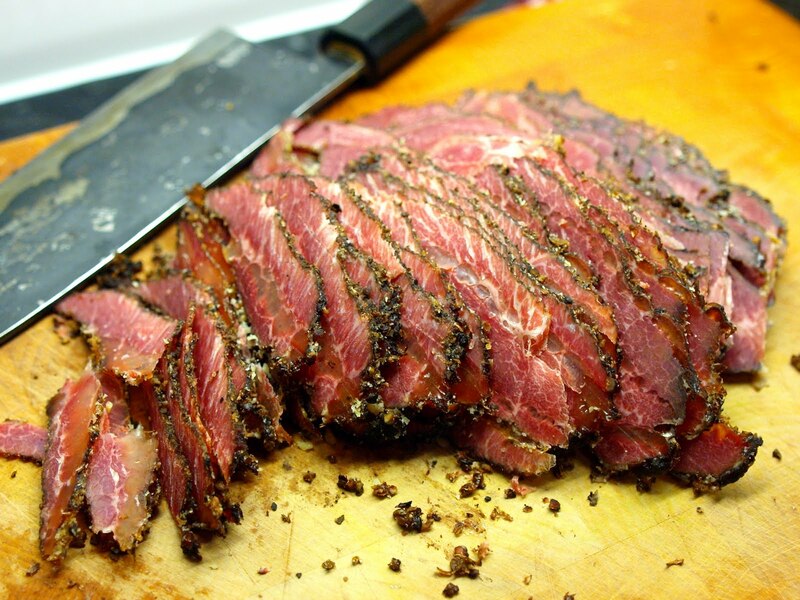 Why have corned beef when you can make pastrami with it? After 3 days rinse and dry the cheeks. Grind equal quantities of black peppercorns and coriander seeds enough to cover the cheeks evenly. Let the cheeks rest uncovered on a rack overnight for a pellicle to form, this will help the smoke to adhere to the meat. Set up your smoker and hot smoke the cheeks at around 100C for 3 hours. I like quite a heavy smoking as I think beef can take it. Also, a heavy smoke is preferable because after 3 hours the cheeks are wrapped in several layers of foil and steamed in a 130C oven till they are tender, test it after 3 hours – a knife should slip straight in. The cheeks are a lot easier to slice thinly when it’s cool and you want to slice them as thinly as possible for the perfect Reuben sandwich. But not only that you have to squeeze dry your sauerkraut first before gently frying in a dry pan with some caraway seeds. This will cook out the sauerkraut, if you use it uncooked then it can be wet and stringy. You are now ready to make your Reuben sandwich. Generously butter the outside of your bread before assembling, preferably rye but sourdough is a great alternative. Lay the pastrami on first then the sauerkraut, Russian dressing next and finally the Swiss cheese. Remember balance is the key, no one component should overpower the other, though I will forgive you if you lay the pastrami on just a little thicker. You are only human after all. Griddle (grill) the whole lot in a frying pan pressing it down till it’s all crispy and the cheese and pastrami is hot and melted together. Beef cheeks make a lot of sense for the home cook, they’re easy to handle and portion. Half a cheek is usually enough for one sandwich. But above all else beef cheeks give an extra sticky juicy quality to the sandwich giving it another dimension of awesomeness. I’m proud to say that it’s the best Reuben I’ve ever eaten and it’s my perfect sandwich. Good Job there! That looks totally awesome, it’s also on my to cook list. Like the cheek pastrami, love the colour of the meat. Definitely going to try this. Cheers Fella, I’ve just been told by the boss (Nick) that my brine is a little strong at 11% but is ok for a short 3 day cure. He prefers an 8% brine and a longer cure. So bear that mind if you want to play around with this recipe. Nick, apologies, I missed your comment on my blog regarding the pastrami. I have recently seen it, given it a go. Your advice hit the spot, thanks so much!! Pingback: Beef Cheek Pastrami Recipe Redux | The Foodist. Next Next post: Is there a good place for sushi in Birmingham?